Creating an online booking website like a travel booking or a hotel booking website is really easy now. With the platforms and tools available in the market, it is possible to create and manage online booking systems without knowing any technical details. You don’t have to be a programmer or a coder to develop a website that display listings online and allows the visitors to book. Therefore, creating and managing websites is now possible without ever dealing with the code files. Such systems make sure that you can create your website on your own, in minutes! However, once the website is created, managing a website is a whole different challenge. You need to make sure that your website is found by it’s expected audience. That your website is always updated with fresh and accurate data, that the performance and service of your website successfully satisfies the anticipation of your users. There are innumerable small and big things that you, as a website owner, should take care of for a successfully running website. Especially when you are running a website based on products (physical, downloadable, subscription based, or bookable) you have to be more careful. Even the tiniest mistake may adversely effect your business. It’s very important that you research and find out all the do’s and don’t regarding your website before you get started. So before you get started with your new online booking business, here are a few points that you should follow and some that you need to carefully avoid. Let’s first talk about the advantageous practices that helps your business grow. All the clauses mentioned in this section directly or indirectly add to the user’s convenience and ultimately helps your website grow. For more information on the must have features on your website, read this article. It is always advisable to use images to represent your bookable product. For instance – If your bookable product is a hotel room, you can provide a visitors with a view of the room. If your bookable product is an appointment at a hair rejuvenation treatment, you can display the before, after images of the treatment. So ultimately, there are always some appropriate images that you can use for your website. Visual graphics tend to explain better than words do. Not saying that words aren’t important, but images are the first thing that can catch the attention of a visitor. Using images followed by a written description of the amenities or the features of your website is a good practice. The written description, confirms what the users sees in the images. Therefore a good combination of images and words will surely fetch good results for your website. Cancellation service after booking is one the most sought of service when it comes to online bookings and appointments. The users prefer a service that offers them full flexibility and the choice to change their mind. We don’t want to trap our customers, right? You can for sure, determine the time before the starting of the booking period till when the users can cancel their booking. For instance – A tourist who books for a hotel room online can cancel his booking till 48 hours of the starting of booking date. So if he has booked the hotel room for 12th of April, he can cancel his booking till 9th of April and will not be allowed to cancel on 10th and 11th. Furthermore, you can also charge a typically low cancellation charge where you will refund the booking amount after deducing a very small percentage of cancellation charge. But whatever your cancellation and refund policy is, you need to mention it clearly (Why?? Read the next section). Whatever your refund policy is, you should state it clearly to avoid any conflicts in the future. State the refund policy clearly and let the users be informed about the rules you’ve set for cancellation at the time of booking or before that. What we want to avoid is the situation where the user is disappointed because he was unaware of the refund rule while booking. Most of the users won’t bother to visit each and every page on your website and find out the cancellation and refund policy. So, if you are going to charge a cancellation fee, or if there’s a time limit within which the users must cancel their booking, you should clearly mention it. For instance – hotels.com automatically detects you location and adjusts the language and currency. Alternately, you can set the currency and adjust the language as and when required. The website is configured to show all the relevant results according the the location. Therefore, this is a feature that helps your website to be more comfortable for your visitors. It adds to the usability and the user experience of your website. This is one of the best marketing strategy to make the visitors book with your website. The competition is intense and there can be a number of websites that provides the users with some nice deals. To stay ahead, you should keep a watch on what the other businesses in your domain doing. Also strive to design deals and offers that are more beneficial to the users. The following are some of the points to take care of when creating deals and offers on your website. 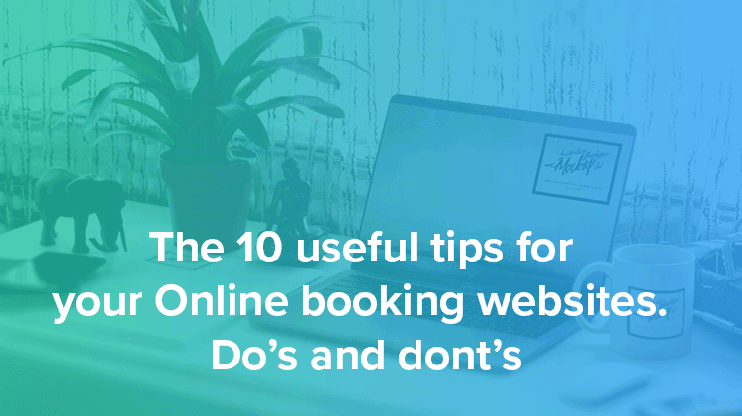 In the previous section, we talked about the important features that helps an online booking system, now lets talk about the things that you should avoid to ensure that your booking website runs effectively. It is obvious that everyone would want to show the brighter side of their product/s. But that shouldn’t be to the extent that you only approve the positive comments and ignore the negative ones. There isn’t any advantage of posting negative comments, obviously! But it adds to the legitimacy of your product. If your website is not well organized, it becomes difficult for both, you and your users. For you, it gets difficult to manage the listings as the number increases, and for the users it gets difficult to find out the listing of their interest. The ultimate goal of your web-design should be that the visitors find their relevant product easily. With these features on your website, you can ensure that the visitors find whatever they want effortlessly. The easier the interface, the easier it is for the visitors to stroll through the website and find what they want. The worst time to lose a customer is while he’s trying to pay but couldn’t. Nothing is as disappointing as loosing a customer because of the inconvenient processing on your website. Following are the few things that you should take care of while setting up the payment processing part of your website. It is important to use images for your bookable products, and its more important to ensure that the images are legit. Visitors expect true and reliable information about the product they see on your website. When booking online, the assume that the images you show with a listing represent how the venue or service actually is. So, you should always use real, and high quality images with any of your bookable product. Remember : We don’t want to add images, just for the sake of adding images. The pictures that you use on your website should be valid, meaningful and represent the actual property or service. A call-to-action section of a website is directly linked to the direct revenue generation. So it is undoubtedly the most important section of your website. So never under-estimate the capability of a call to action section in your website. Plan a call-to-action on the most effective place of your website. This article was about the basic hacks for an effective online booking system. Taking care of a few things can become most helpful for your website. Once your website is ready and you’re in the market, you’ll gradually learn new facts and tricks for the smooth running of your business. Online booking websites are now easy to create, but to have them running successfully, you will need skills and patience. However, with experience from the market and continual research and analysis, you can take your online business to the top! !